The Coronet on Geary was closed last March. 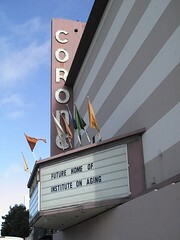 Recently the marquee has been changed, announcing that they’re going to turn it into the Institute on Aging. Cinema Treasures has the low down on a lot of other local theaters and once-theaters, like the Apollo on Geneva which got converted into a church and (according to the site) is now a Walgreens, and the El Rey on Ocean which was also converted to a church. It makes me sad, in a way, to see old movie theaters shut down, but I rarely go to the movies so I really can’t complain. Still, there’s something wonderous about going to a vintage theater that’s been kept up when the house is more full than empty and the crowd’s in good spirits. I’m romanticizing, I know… but the AMC is not romantic.